KEMEROVO, August 27. /TASS/. Russia managed to retain the status of a leader on the global energy market despite artificial restrictions in recent years, President Vladimir Putin said on Monday at the meeting of the presidential commission on the fuel and energy sector. 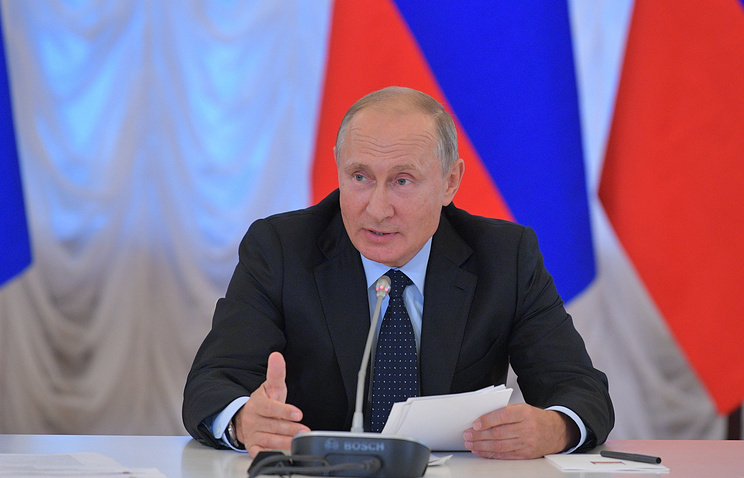 “The Russian fuel and energy segment has managed to efficiently respond to challenges it faced in the environment of a complex market situation in recent years and artificial restrictions,” the Russian leader said. “Russia again confirmed its status of one of leaders on the global energy market as of the last year-end. We became the world’s first by oil production and the second by gas production,” Putin said. “Russia is among leading countries by electric power generation and coal mining, ranking fourth by electric energy and sixth by coal across the globe,” he said. The fuel and energy sector is playing an important role in increasing the pace and quality of economic growth in Russia, Putin noted. The segment accounts for about 22% of the national GDP, nearly 60% of export and 40% of federal budget revenues, according to data cited by the President. Russian energy companies are boosting investments into development. “The amount of investments rose by 10% last year and totaled 3.5 trillion rubles ($52.1 bln),” Putin said. Greenfields are developed and the transport infrastructure is evolving, he added. Hey Buddy!, I found this information for you: "Putin: Russia affirms status of one of leaders on global energy market". Here is the website link: https://russophile.org/putin-russia-affirms-status-of-one-of-leaders-on-global-energy-market/. Thank you.